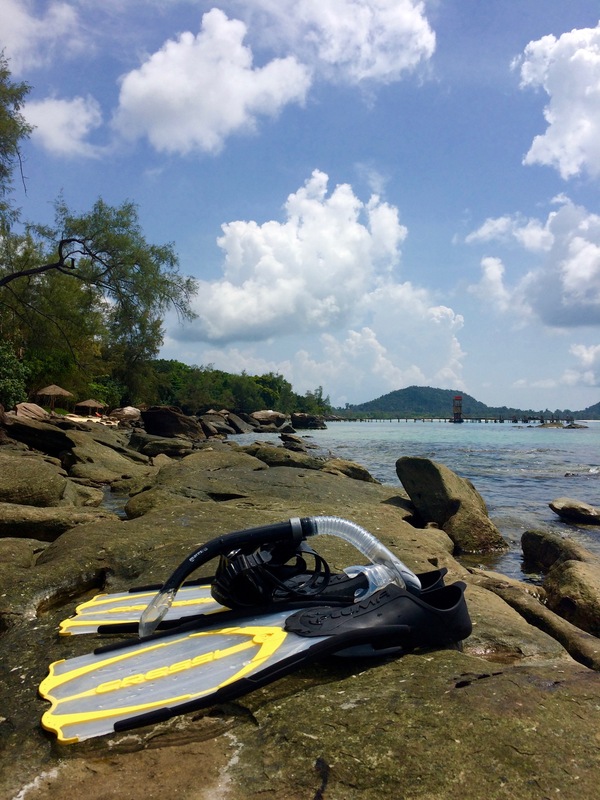 Where are the best spots to snorkel in Cambodia? 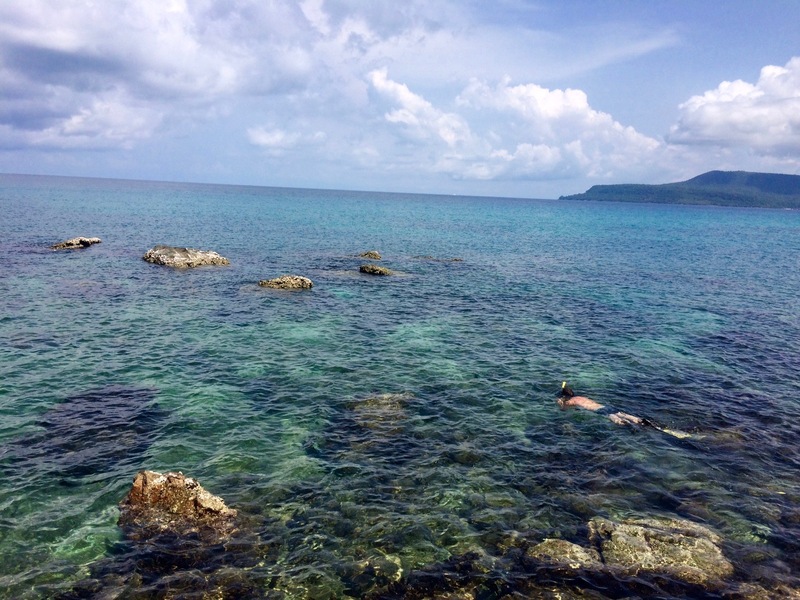 I searched the internet and made a mental note that there was snorkelling on Koh Rong (Cambodia’s second largest island in the Gulf of Thailand). Upon arrival we were stunned by the sunset and excited to get into the clear water since I had packed around my snorkel gear for a month. I asked the young locals at the Bungalow about the best reefs to snorkel but they had no idea, they were too stoned to get out of their hammock and even go swimming. 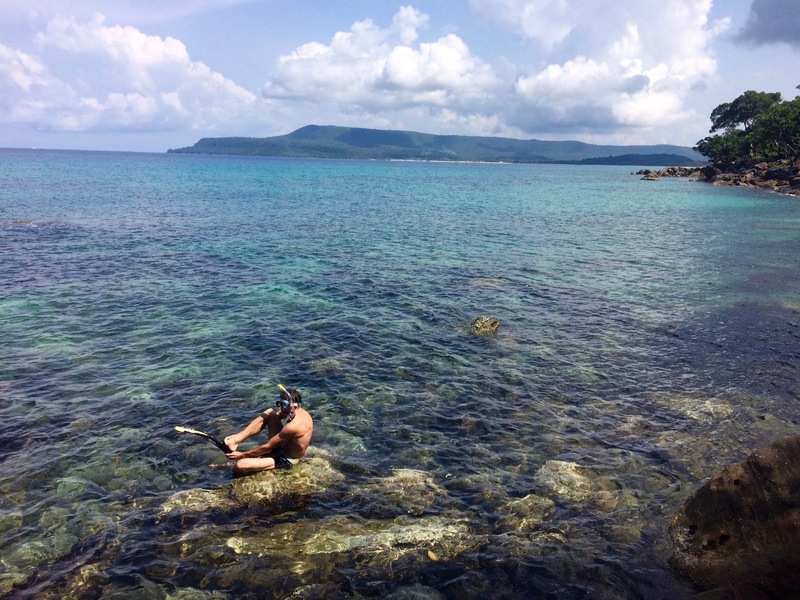 In the main center, Koh Toch there are a few tourist booking agents that advertise a sunset trip out to Long beach (this is an easy hike over a hill or a 4 km walk along a dirt road through a new property development) or a snorkelling trip out to Lonely beach for 25 USD per Person. I went back to the bungalow and searched the internet but there were no maps or snorkel site locations. It would have to be trial and error. What could be found, I am a PADI trained scuba diver (fact) and not chuffing a massive cigar sized joints. 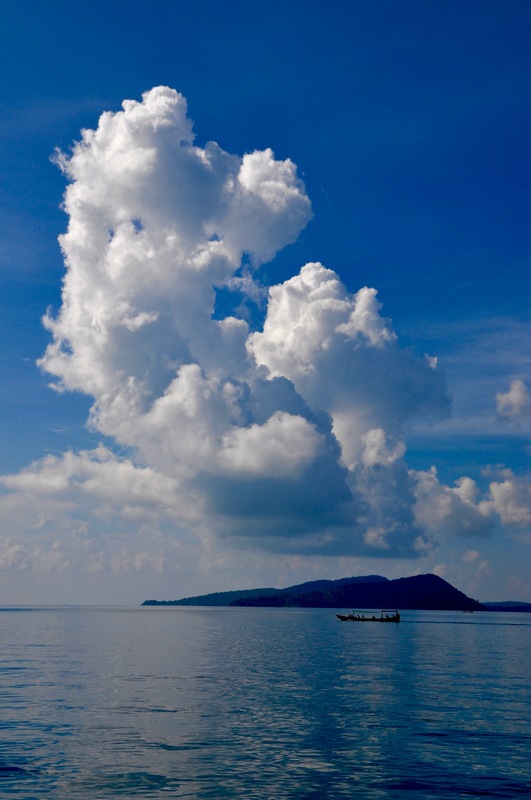 The island is a 45 minute ferry ride from Sihanoukville and is massive. 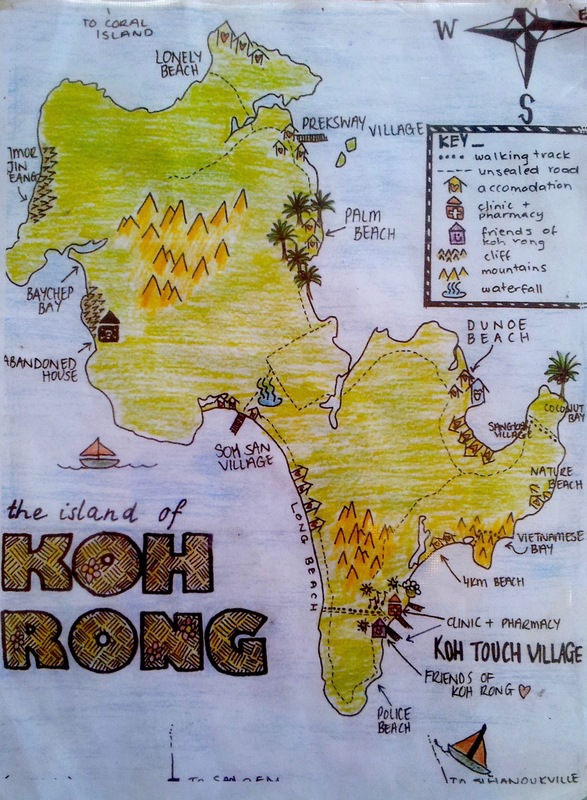 The main town is Koh Toch and consists of 3 big piers, ten bars, some local food places, five stores with all that you would need, 5 to 10 big backpackers places with food dorms and general chaos. 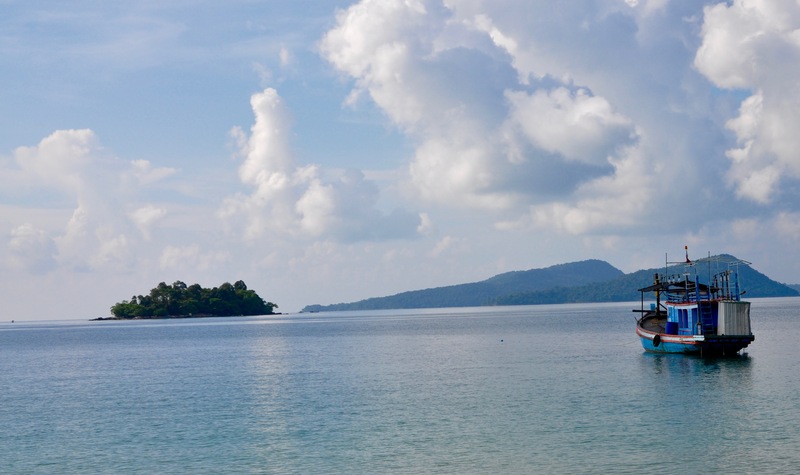 The island has lots of nicer Bungalow places spread out all over the island on numerous secluded white sand beaches. We stayed on 4km beach, which was quiet and directly on the beach but eating options were limited. 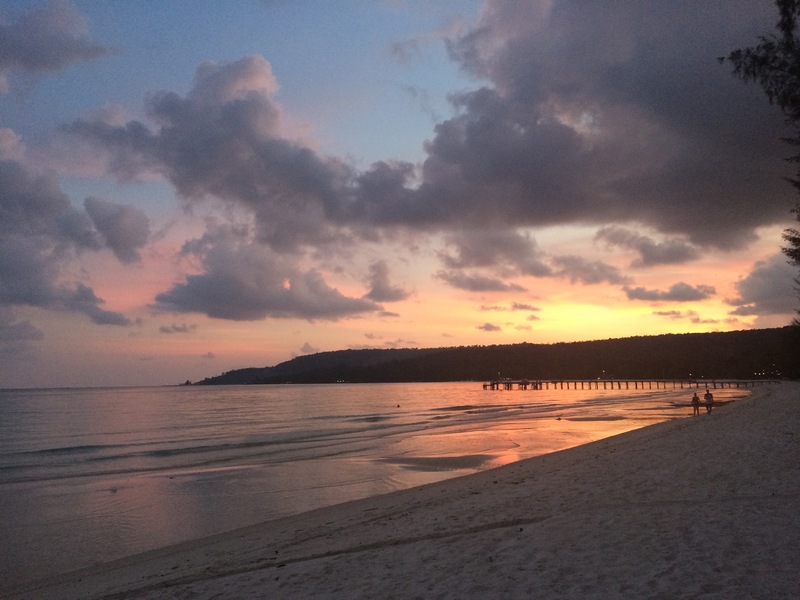 We also stayed in Koh Toch, the eating was better and the beach only a short walk away. 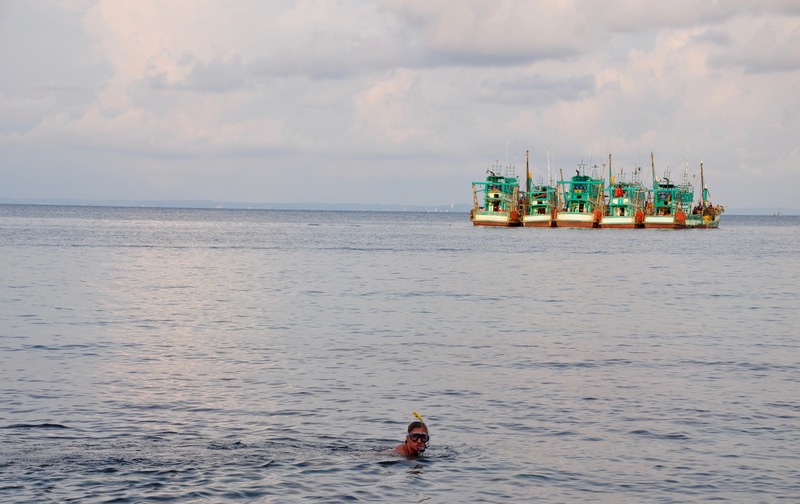 I saw a lot of damaged reef around Koh Rong and in my opinion it was from dynamite fishing years ago but the corals and fish are coming back now. Between the town and Police beach just a 2 to 5 minute walk from the piers is an area of nice reef. There is a variety of colorful fish, the coral is regenerating nicely and visibility is the best. Just on the rocky point, and only 5 to 10 minute walk from the piers. Here there is the best variety of fish life, with some big fish and lots of hard corals, sponges and anemones. The area extends from the shore to 100 meters out. You can rent kayaks for 6 USD in Koh Toch for a half day and paddle out. There are lots of boulders which provide small channels, for the fish to hide and eat. Needlefish, Angelfish, Sea urchin and sea cucumber can be seen. To get here one option is to hike the hill behind Koh Toch on a rocky little trail for about 45 minutes but the use of flip flops is not recommended. Corals – Boulder Brain coral, Porites, Stoney coral, Meandroid coral, Finger coral, Mushroom Leather coral, Pencil coral, Lettuce coral, Common Razor coral and Mountainous Star coral. Fish – Grouper, Parrot fish, Golden Rabbitfish, Snapper, Tomato Clownfish, Angelfish, Butterflyfish, Seahorses, Needlefish, Bannerfish, Wrasse, Yellowfin Goatfish, Barracuda, and Porgy. Other cool things – Sea Cucumber, Banded Sea Snake, White Scroll Alga, Anemone, Long Spined Sea Urchin, Giant Barrel Sponge, Leafy Rolled-Blade Alga and West Indian Sea Egg. Take moredaysoff to swim in foreign waters, experience different cultures, climb to new heights, capture memorable images, tell stories and savour fantastic foods.